One iconic historic event that defines Boston around the world is the Boston Tea Party, and thanks to the Boston Tea Party and Museum, this experience can be relived. Standing aboard restored tea ships, visitors are transported back in time as they watch the dramatic events of the Boston Tea Party unfold in the live reenactment. This authentic feel is crafted through the rigorous vetting process the museum undergoes to find the perfect actors. But what does make a person fit for this unique type of acting? According to Creative Manager Evan O’Brien, there are three key characteristics an actor must have, and finding the combination of the three isn’t an easy feat. “It’s not a job for everybody, you really have to be able to talk to people, give that customer service and retain the information and present it accurately to a world-wide audience,” said O’Brien. 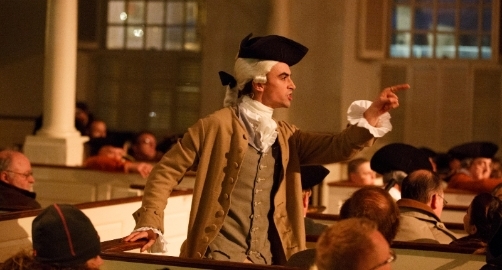 Hefty competition for such coveted roles as John Hancock, Paul Revere, Samuel Adams and other significant historical figures has led to the selection of the 36 current enthusiastic actors. “There’s the story of two Boston Tea Party Museums,” began O’Brien, as if in character and setting the scene. O’Brien went on to tell the tale of how the original museum, built in 1973 to honor the bicentennial of the Boston Tea Party, was struck by lightning and burned down in the harbor around 2001. “But, it rose like a phoenix out of the ashes again in 2012, with a brand new, modernized museum,” said O’Brien. O’Brien himself was hired as the first employee in 2011 and immediately immersed himself in script writing, costuming, planning for a year until the reopening in 2012. When he’s not managing office logistics, guests may recognize O’Brien as John Rowe, a complex merchant, who is best known for having the tea aboard his ship during the Boston Tea Party, but ironically wanted nothing to do with the tea debate. Whether touring through the museum, gathering for dinner at a Tavern Night or taking a virtual skype tour with the actors, the passion and level of dedication displayed by the museum’s staff adds life and vibrancy to an iconic American event.